Villa Baan Chirawan is a 8-bedroom luxury villa tucked in the exclusive Sri Panwa Resort at the southern end of Phuket in Thailand. Guests staying at this gorgeous holiday retreat enjoy full access to the resorts facilities, including a secluded white-sanded beach, a tennis-court and a gym. 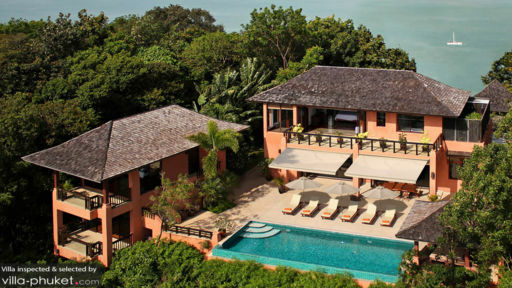 The villa features two contemporary double-storey pavilions and a large tropical outdoor area with a glorious infinity pool. Villa Baan Chirawan has won numerous awards for style and luxury, promising an unforgettable stay on the beautiful tropical island. 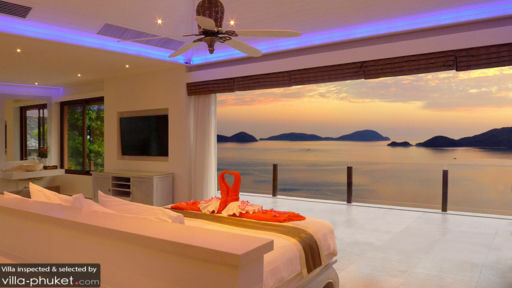 The master bedroom features a private terrace and a breezy balcony with spectacular ocean view. The room is furnished with a deluxe king-size bed topped by Egyptian cotton bedlinen, a HD TV with 200+ satellite channels, a mini-bar and an amazingly luxurious en-suite bathroom with indoor and outdoor showers plus a double-ended bathtub with sea view. Villa Baan Chirawan houses 7 more bedrooms and the last bedroom is tucked in a separate pavilion by the pool-side, doubling as a lounge area or a massage room. All of the bedrooms come with high-quality beds, air-conditioning, dressing-rooms, minibars and luxurious en-suites of which all but one are fitted with a bathtub. The rooms in the main pavilion also feature satellite TVs for entertainment in the night. The outdoor area of villa Baan Chirawan comprises a stone terrace encompassed by the tropical surroundings that grow lushly around the property. The view over the azure blue ocean with several small islands as the backdrop is just breathtaking! The crystal clear water of the pool blend in seamlessly with the ocean view, making it a truly amazing experience to dip into the pool and gaze over the edge. On the pool-deck stand teak timber sunbeds for those wanting to tan and for those seeking shade there is a gazebo with a comfy day-bed to chill out in. On the veranda stands a large table for alfresco dining to the view of another magical sunset. Outdoor dining gets even better with freshly grilled food from the stainless steel grill BBQ set. Guests lounging and dining in the air-conditioned living room don't have to worry about missing out on the panoramic ocean views as the pavilion has been designed with floor to ceiling glass doors that fold open to the outdoor area. This high ceilings of the pavilion give a real sense of spaciousness and openness and the classy Italian marble floors combined with custom teak furniture add to the sophisticated and classy feel of this villa. The living room is furnished with comfy sofa's for relaxing, reading and watching movies on the HD satellite television set and there is a large teak dining table to enjoy the mouthwatering dishes prepared by the chef. On top of that, the villa also features a billiard table, a home cinema with projector and screen, a playstation 3 and table tennis for full blown modern entertainment. Highly trained, attentive and dedicated staff will make your stay even more pleasurable. The personal concierge is always around when needed, handling special requests and answering all of your questions. The villa offers complimentary laundry service. A Thai chef can be arranged for you upon requests for tasting the rich local cuisine within the comfort of your own holiday home. 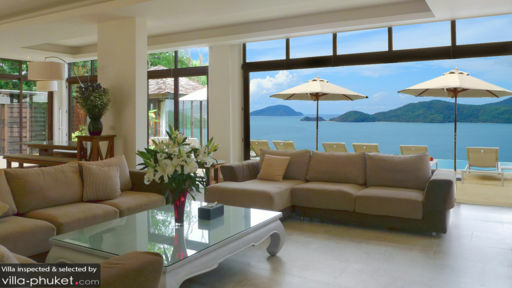 The villa is located in the south of Phuket, near to numerous pristine beaches. The azure Andaman sea is perfect for swimming all year round. The private beach of Sri Panwa is just a stone's throw away. ATM,s groceries stores, taxi's and pharmacy's are all in walking distance of the villa and Phuket town, where you can go shop and dine, is just a 10 minute drive away. Next to the entrance of the resort there is an Aquarium, which makes a perfect family day out. My friends and I stayed at Baan Chirawan in October 2016 for a period of 5 days. We were 16 people in total; 4 families each with 4 people in it, so it was a big group. Firstly, the villa is gorgeous. The rooms are spacious and very modern. There is plenty of space for families to have privacy but also come together. We especially loved the pool side room where we could get massages and enjoy the surrounding beauty. The villa also had numerous staff who were there daily to make our trip amazing. They were helpful and very friendly. They even went out of their way to help us with our young kids. The staff also guided us with organizing things to do in the city, help us plan meals, sort out any on the spot requests for drinks, internet, site seeing etc. The cook especially was amazing. She made all kinds of dishes, working with everyone's dietary requirements and needs. We didn't feel the need to every leave the villa and go out to a restaurant. The villa overall was the best part of our trip. We definitely hope to be able to visit Phuket again and if so we plan to stay at Villa Baan Chirawan. Two weeks holiday here was the best. Awesome views, with all the amenities. The house had swimming pool and large kitchen and indoor and outdoor dinning areas. Lovely well kept garden and helpful friendly and English speaking staff. One of the rooms had its own outdoor shower and bath.